Many of us have dreamed of becoming Disney Cast Members at one point or another. Many young adult fans consider the Disney College program, but did you know that Disney also offers professional internships? Disney's professional internship program goes back to the earliest days of the company when Walt was creating something so special and unique the only way to get the job done was by hands on learning and exploring. Today upwards of 2,500 participants each year come to the Disney Company for professional advancement in a wide variety of careers. Check out what they have to say in this video. 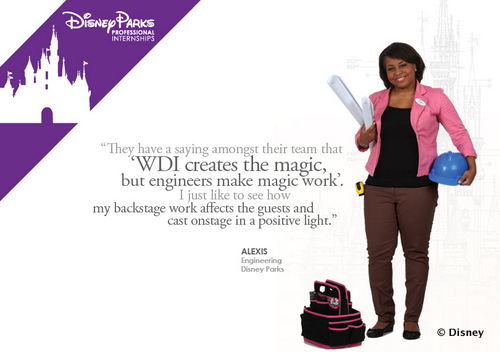 With more than 450 different types of internships offered the program not only offers general job training, but can be a stepping stone to a Disney career. Some of the areas of work range from "technology to production to finance, and even internships related to animals and the environment". These paid internships give students an added level of stability as they begin the next adventure in their life. I wish I would have known more about the fun and fantastic career opportunities available at Disney when I was a young adult. Would you ever consider working with Disney to expand your career? If you're interested in learning more about Disney Internships check out the program website at DisneyInterns.com. I'd love to do this! I have heard it is incredibly difficult to get a Green Card though - even for UK citizens. A girl can dream, though!